← Testing just gives him another reason to call himself a failure. 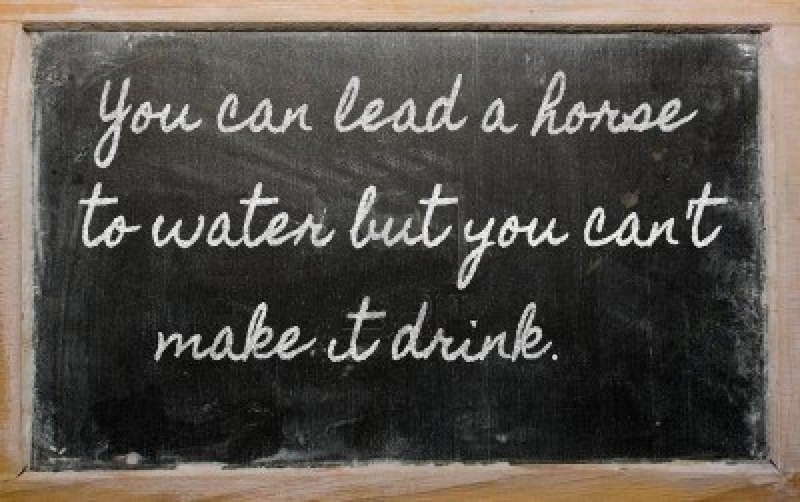 “You can lead a horse to water, but cannot make him drink.” This old saying pretty much sums up the education profession. Teachers and other education professionals devote their lives to imparting knowledge to children day in and day out in the hopes of helping them learn about the world around them and how to make their way as productive members of society. However, not all children are the same and they do not learn in the same way or at the same rate. Educators “lead children to water” each and every day, but it is not up to us whether or not they will drink. Perhaps they aren’t thirsty, perhaps they haven’t developed an affinity for a certain type of water, or perhaps they haven’t yet learned how to drink in the ways we are asking them to because they are not developmentally ready to do so; either way, we provide the water for when they ARE ready. With the ever increasing emphasis on high stakes testing and usage of cookie-cutter curricula, we are expecting ALL children to drink the exact same water at the exact same time…and then punishing them when they will not or cannot. This isn’t fair on any level. It sends a message to our children that they are consistently “not good enough”, when the message should be “never stop learning”. It sends a message to educators that we are not valued. That we cannot be trusted to do our job. That we are inadequate. That we are doing our children a disservice, despite giving everything we have to give every single day…whether we are with the students or not. This attitude has permeated our society and is eating away at our profession like a cancer. It has turned our own nation against itself, as the message being spread is that we are “broken”, despite the fact that those of us on the front lines continually push back against that idea because it simply isn’t true! And we of all people would know! High stakes testing has done nothing more than tell an entire generation of children that they are failures; yet when they manage to rise to the occasion, under more stress and pressure than ever, are they rewarded for their efforts? NO! They are simply told that the proverbial “bar” has been raised again, so guess what? They still FAIL. Once upon a time, teachers could utilize data from assessments they created to inform their teaching, create new lessons, go back and reteach skills that were missed or misunderstood, promote discussion, or even accelerate their teaching if appropriate. These days are long gone and have unfortunately given way to scripted curricula with strict pacing guides and meaningless tests that neither tie to said curricula or measure anything real. Life is not a series of multiple choice answers, and yet this is how we are forced to present the world to children in the “testing era”. It’s no wonder our young adults are not ready for the workforce…how can they be when they have never been taught to make decisions or solve problems for themselves? They’ve only been shown that someone will provide a set of answers for them from which they must choose the “right” one. This entry was posted in End High Stakes Testing, Measuring Effective Teaching, Special Education, Standardized Testing and tagged 3rd Grade Retention Policy, Bill and Melinda Gates Foundation, Bill Gates, Corporate Education Reform, Deaf, Deafness, End High Stakes Testing, Gates House of Cards, Gates House of Cards Action, High Stakes Testing, Special Education, The Bill and Melind, You can lead a horse to water but you can't make it drink. Bookmark the permalink. 21 Responses to Every single one of my students “failed” the state test this past school year, and only 1 student passed in the entire 3rd grade at my school. Does this mean my colleagues and I are poor teachers? Thank you for enlightening me on the difficulties deaf children have learning to read and the inhumanity of the tests for them. I hope you will send this on the the Senate’s HELP committee. As a “retired” (a teacher never retires) teach who taught in the 70’s & early 80’s when individualized curriculum was encouraged I heartily agree w/ the above teaching philosophy. Let’s get back to teaching the student, not the class. I started in 1972, so remember when “teaching to the test” were dirty words. Not now, it’s survival for the teacher, children, and school. “Teaching to the test” are still “dirty words”, but now they are cloaked in language stolen from educators by the corporate reformers. Thank you for re-blogging this amazing letter by Michelle Cosgrove! This isn’t about deaf children. It’s about ALL children. It’s about teaching through a child’s strengths vs. their weaknesses. It’s about stop labeling kids smart ( because we’re all smart in our own way) and stop labeling them dumb (because even the smart kids are dumb in some ways). The problem with the United States is we as a nation don’t value those little nuances that make people unique. We value Mensa smart over Creative smart, yet IBM insists that they need creative thinkers, people who take data and information and do something different with it. I think the gradual and complete annihilation of arts and music programs is really putting our children at an overall disadvantage in the global marketplace. That ALL children are concerned, not just this-or-that subgroup, is a fundamental and sad truth that I myself wanted to point out. However, I disagree somewhat with the details in this comment. A less important point of (at least potentiell) disagreement is teaching creativity through arts and music: The type of creativity that is sought by an employer lies on a somewhat different dimension and can be legitimitately trained by other means, e.g. math and problem solving—likely better so than with music. To equal “creative arts” with “creativity” misses the point, seeing that the variations of the word have different meanings in different contexts. Fantastic letter! This should be required reading for every administrator, superintendent, and so called “leader” in politics! Thank you Michelle. We wholeheartedly agree. We feel very strongly that a class action lawsuit needs to be taken regarding high stakes testing for ALL children, and especially those with special needs, and our ELL/ESL students. The high stakes have to stop. So does all the test prep and the overemphasis on testing period. You are obviously a very smart , dedicated, caring teacher…I agree…the testing garbage has to go!! Every student is unique, with their own talents and weaknesses….as is everyone in this world…I am betting all of those so-called “leaders in politics” couldn’t pass those required tests if their lives depended on it!! We ought to require all lawmakers to take the current exams and publish the results, no? Then we can begin the consequences… fair is fair, right? Thanks for speaking out about this kind of discrimination. I think every teacher’s master’s degree program has to include a class on assessment. We take the class, learn about validity and reliability, yet encounter tests that are not valid in our teaching. For your students, Michelle, the test being given is not valid. I’m a special ed. teacher, currently of hearing students, and for those whose skills are two or more years below grade level, the state test we use is not valid. The alternative assessment is for students with cognitive disabilities, and is not a good measure for kids with learning disabilities. I celebrate the success of my students who are within a year of grade level and can pass our state tests, but I cringe at giving the test to those who just aren’t ready to take it. Tim, we need parents to begin a class action lawsuit. This is inhumane and needs to be stopped. I too am a Special Education teacher. Parents, if you have children with special needs, please find one another and begin to act together. Teachers will stand with you! I have never seen a real quantitative collection of evidence in student growth by the state or federal government. Everything I see is percent passing state test or ap test. Neither is a direct result of a specific teacher or the education system as a whole. The kids drink the water we give them. All of them improve over the coarse of a year. The quantity of improvement is very difficult to quantify. Grades don’t effectively measure improvement. Standards based grading might be better, but doesn’t either (at least the methods I have seen) because of the style that the standard based questioning are typically written. All the results of high stakes testing are based on “junk science”. The evidence is there, but the lawmakers and corporate reformers are not held accountable by data. We need to stop that nonsense and begin to hold them accountable. Another special Ed teacher here….I had to give the third grade state test to a child who had been abused and took forever to learn at a first grade level because he would have a meltdown or run away whenever he made a mistake. He equated making mistakes to being in trouble, and being in trouble with being burnt with cigarettes. He was just starting to see himself as a reader and chose books to read for the first time, until a month later I had to give him the state reading test at the third grade level. He couldn’t read it, of course, but was in my room all day, agonizing over each passage and question, crying and self-injuring, because he believed that he had to finish the test or he would be in trouble. Yep, that’s what we’re doing to help our most vulnerable kids. Pingback: Tony's Thoughts » Teachers Flunk Bill Gates on School Improvement! I recently attended a training in which the leader, very informed and innovative, explained that all children except for “Learning Impaired” are expected to do well on the tests because all the other needs are able to be improved and brought to grade level with interventions. On the surface that is true, however It’s just not that simple. It doesn’t happen overnight.